At 875 square miles, Jacksonville is the largest city by land area in the continental U.S. and the fifth fastest-growing, according to a 2017 list compiled by Forbes. Business Insider ranks Jacksonville No. 2 on its list of “10 U.S. cities where everyone wants to live right now” based on migration and population data from realtor.com. 24 Jacksonville-area firms made the 2017 Inc. 5000 list of fastest-growing U.S. companies. Ponte Vedra Beach-based E-file.com grew by 4,000% in three years. Total Earnings / $44.03 bil. Total Retail Sales / $23.89 bil. Offering direct trade with Asian ports through both the Panama and Suez Canals, JAXPORT has recorded an average of 21% annual growth in Asian container volumes since 2013. 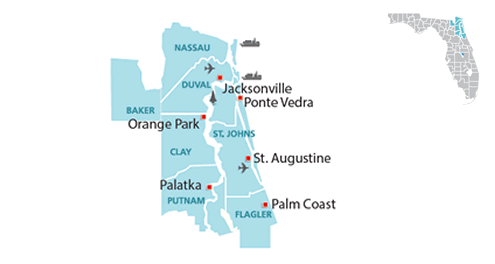 JACKSONVILLE UPS will invest $196 million to expand its ground package hub with the addition of advanced technology and operations automation. Scheduled for completion in fall 2019, the expansion will allow for a 33% increase in processing to more than 80,000 packages per hour. JACKSONVILLE 2016 was a banner year for JAXPORT, which moved a record 968,270 TEUs and saw 19% growth in its container trade with Asia. Since entering this sector in 2009, Asian trade accounts for 36% of JAXPORT’s total cargo business. Also recorded in 2016: double-digit growth in automobile imports. State-of-the-art, 100-gauge cranes, capable of lifting up to 65 tons, began operation in December 2016. 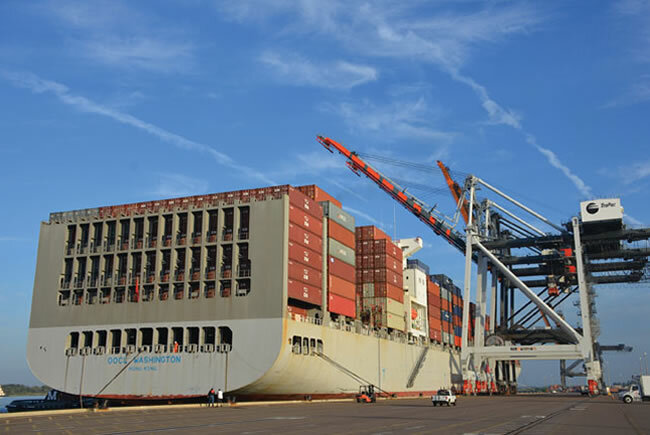 JACKSONVILLE In November 2016, Crowley Maritime was awarded a contract to provide transportation and related services supporting Department of Defense activities in the U.S. and Canada. The contract could be worth up to $2.3 billion over seven years and is expected to create 70 jobs. ST. JOHNS COUNTY Burkhardt Distribution is constructing a 113,000-sq.-ft. office/warehouse to serve as company headquarters and distribution center; completion is set for late 2017. While construction continues toward a fall 2017 opening of its new 800,000-sq.-ft. fulfillment center near Jacksonville International Airport, Amazon announced plans to build a 1-million-sq.ft. fulfillment center on Jacksonville’s west side. Total employment: 2,500.